Details, it's often all in the details. And getting shots of the wedding rings often gives an excellent opportunity to get those all important details. Couples often have small items or fun thing that will go well with an arrangement of their rings, and this was one example of just that. 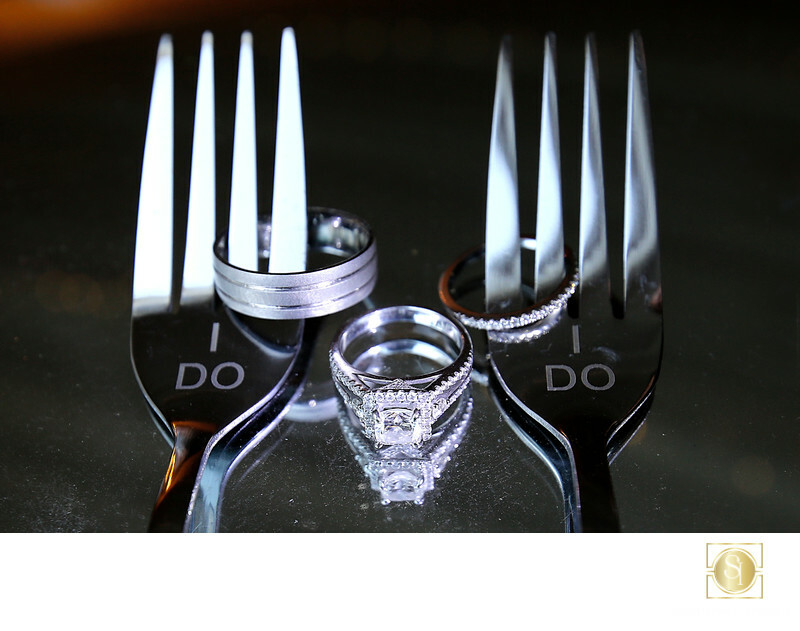 The cute forks hold two of the rings and the third is nicely framed by them and the whole set-up is nicely reflected on a mirrored table top. Of course, the right lens is needed to get the detail and get close enough to frame the image. A macro lens is nice, but of limited utility. This image was done with the Tamron 15-30 f2.8 VC, which has a minimum focal distance of mere inches. The wide angle aspect gives a unique perspective, too. Coupled with the resolution of modern DSLRs, it's an unbeatable lens for all around use at a wedding. Location: Ritz-Carlton Hotel, Laguna Niguel. Keywords: elegant wedding (21), Hotel wedding (3), Ritz-Carlton wedding (3), Shadowcatcher Imagery (12).